BayBrazil: Brazil has been in the spotlight in recent years and is projected to be among the largest economies. Analysts forecast Brazil’s economy will grow about 3.5% in 2010. Is this realistic? Cortes Costa: It is realistic to expect that the Brazilian economy will grow more than 3.5% this year (actually, in recent forecasts, this percentage may reach 6%). Forecasts take into consideration a consistent inflow of investments as a result of positive factors such as internal market strength and our economic and financial institutions stability. BayBrazil: With a banking system heavily regulated, Brazil seemed to have escaped from the financial crisis. Has the U.S. economic crisis impacted Brazil? Cortes Costa: The crisis that impacted industrialized economies, including the US, had worldwide repercussion, but in different ways, according to each country’s economic situation and characteristics. In Brazil, although the crisis has undirected affected the country’s economy, as it led to the reduction of international trade demand levels, such consequences were largely offset by the stimulus given to internal consumption, by means of increased credit access. In addition, economic stability and an effective regulation of the financial system have also played an important role to minimize such effects. BayBrazil: How would you describe the Brazil-U.S. relations today? 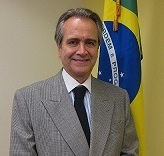 Cortes Costa:Brazil and the U.S. have many similarities and a long history of good and fruitful relationships. Both countries have large territories, and large populations that share the same democratic ideals of liberty and respect for human rights. Our governments enjoy today one of the highest stages in their bilateral relations as a result of ample economic and trade interests, as well as of their ability to foster scientific and technological cooperation. This positive development between the two countries is set on a basis of mutual respect and political understanding in both administrations. BayBrazil: Your home town Rio de Janeiro has been recently selected to host the 2016 Olympic Games. What does it mean for Brazil? How is the country getting ready for it? Cortes Costa: The 2016 Olympic Games in Rio de Janeiro will have a significant political meaning in the history of the Games, as well as economic importance to Brazil in general, and Rio de Janeiro in particular. It is the first time that such event takes place in South America, and this will attract worldwide attention to the region in the form of new investments and tourism flow. The preparation to build the necessary infrastructure has already begun and will be specially stimulated by the fact that the entire project was conceived with a strategic vision of integration between work and social development of the areas where works will take place.